82 Commonwealth is located on the south side of Commonwealth, between Berkeley and Clarendon, with 80 Commonwealth to the east and 84 Commonwealth to the west. 82 Commonwealth was built ca. 1872 as the home of Edward Page, an importer and dealer in iron, steel, and rails, and his wife, Elizabeth D. (Adams) Page. They previously had lived at 51 Chestnut. In his Houses of Boston’s Back Bay, Bainbridge Bunting indicates that both 82 and 86 Commonwealth were designed by Theophilus P. Briggs. Theophilus Briggs was a housewright and carpenter, rather than an architect, and probably also built the houses. Elizabeth Page purchased the land for 82 Commonwealth on June 1, 1871, from attorney Edward Ingersoll Browne, It was part of two lots he had purchased from the Commonwealth of Massachusetts on April 28, 1871, and May 2, 1871. Edward I. Browne was unmarried and lived at 52 Commonwealth. Click here for an index to the deeds for 82 Commonwealth. During the 1887-1888 winter season, the Pages were living elsewhere and 82 Commonwealth was the home of George Robert Barrett and his wife, Elizabeth M. (Lawrence) Barr Barrett. The Barretts also owned a home in New Ipswich which he had inherited from his parents in 1887, where they had operated a farm (Barrett House is now one of Historic New England’s properties). 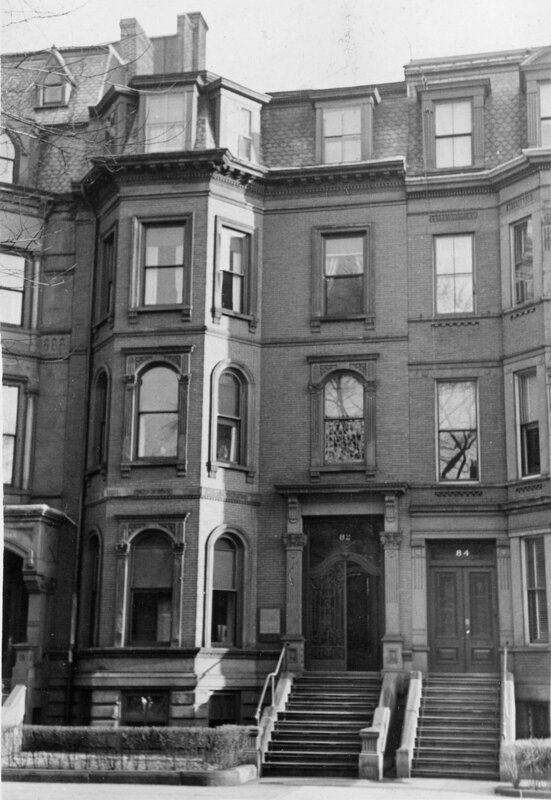 By the 1888-1889 winter season, the Barretts had moved to 14 Arlington and 82 Commonwealth was once again the Pages’ home. They continued to live there in 1892, but moved soon thereafter to Weston (Elizabeth Page died in 1902; on March 31, 1904, their unmarried daughter, Mabel, was murdered; the trial and conviction of Charles L. Tucker for her murder were widely publicized). During the 1892-1893 winter season, 82 Commonwealth was the home of architect Arthur Rotch and his wife, Lisette de Wolf (Colt) Rotch. They had been married in November of 1892, and 82 Commonwealth probably was their first home together. Prior to their marriage, Arthur Rotch had lived with his mother at 3 Commonwealth. Arthur and Lisette Rotch had moved to 234 Beacon by 1894. During the 1893-1894 winter season, 82 Commonwealth was the home of Mrs. F. L. Morton. The house was not listed in the 1895 Blue Book. On February 8, 1895, 82 Commonwealth was purchased from Elizabeth Page by Henry Montague Thompson. He and his wife, Margaret (Sutherland) Thompson, lived in Malden. He was associated with (and later would own) the firm of Potter & Wrightington, manufacturers of canned food and cereal, marketed under the “Old Grist Mill” label. On May 6, 1895, 82 Commonwealth was acquired from H. Montague Thompson by Henry (Harry) Staples Potter, one of the principals of Potter & Wrightington. He and his wife, Sibyl T. (Gilman) Blume Potter, made it their home. They had married in August of 1894 (she was the former wife of attorney Andreas Blume, whom she had divorced in 1893). 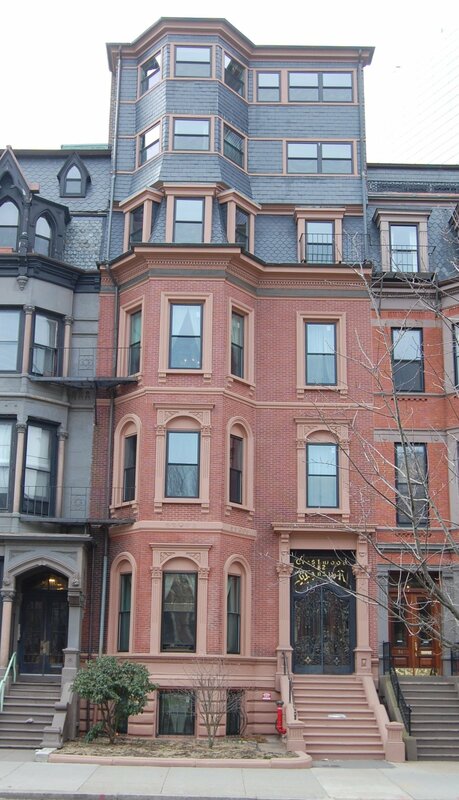 Prior to their marriage, Henry Potter had lived at the Copley Square Hotel and Sibyl Blume had lived at 288 Commonwealth. Living with the Potters were his children by his first marriage – Henry S. Potter, Jr., who worked in his father’s food business; Alexander Carleton Potter, a physician; and Grace Florence Cogswell Potter – and Sibyl Potter’s son by her first marriage, Howard Blume (who took the name Howard Potter). Henry Potter, Jr., married in October of 1898 to Grace Minerva Bradley; after their marriage, they moved to Brookline. Grace Potter married in November of 1901 to Richard Dresser Small, a physician in Portland, Maine. Alexander Potter continued to live with his parents until his marriage in June of 1909 to Gertrude Elizabeth Browne, after which they lived in Cambridge (he maintained his medical office at The Abbotsford at 184-188 Commonwealth). Also living with the Potters was Sibyl Potter’s mother, Mary (Jones) Gilman, the widow of Albert S. Gilman. She died in October of 1908. By the 1911-1912 winter season, the Potters had been joined at 82 Commonwealth by Sibyl Potter’s niece, Sibyl (MacKenzie) Snyder, the widow of Kansas City banker and businessman Robert M. Snyder. She had lived with her step-son, Robert Snyder, Jr., in Kansas City at the time of the 1910 US Census. Harry Staples Potter died in June of 1919. Sibyl Potter continued to live at 82 Commonwealth with her son, Howard (Blume) Potter, and her niece, Sibyl Snyder, during the 1921-1922 winter season. She then traveled abroad and by the 1924-1925 season was living at 11 Gloucester. On July 13, 1922, 82 Commonwealth was purchased from the estate of Harry Staples Potter by Dr. Allen Greenwood, an ophthalmologist and professor at Tufts Medical School. He and his wife, Marion E. (Tucker) Greenwood, lived in Wellesley. Allen Greenwood converted 82 Commonwealth into a combination of medical offices and a multiple dwelling, either apartments or a lodging house. He maintained his office there and he and his wife continued to live in Wellesley. In December of 1934, the Greenwoods acquired 84 Commonwealth. In January of 1935, Allen Greenwood applied for (and subsequently received) permission to cut a door between 82 and 84 Commonwealth on the first floor, and in March of 1936 he applied for (and subsequently received) permission to cut additional doors through on the second and third floors. In 1936, Allen and Marion Greenwood made 84 Commonwealth their home; he continued to maintain his office at 82 Commonwealth. Dr. Greenwood continued to maintain his offices at 82 Commonwealth until his death in October of 1942. On April 9, 1943, Allen Greenwood’s estate sold both 82 Commonwealth and 84 Commonwealth. Both properties changed hands and the connecting doors presumably were eliminated. On July 17, 1944, 82 Commonwealth was acquired by Catherine R. Edson and Caroline E. Roberts, both of New Milford, Connecticut. It continued to be a multiple dwelling, probably a lodging house. 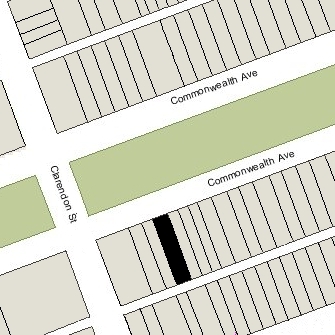 On March 14, 1947, 82 Commonwealth was acquired from Catherine Edson and Caroline Roberts by Daniel Elmore Gray and his wife, Laura M. (Hawkins) Gray, who appear to have occupied it as a single family dwelling. They previously had lived in Brookline. He was retired, and formerly had been sales manager for the Beacon Falls Rubber Shoe Company. They continued to live at 82 Commonwealth until about 1953. On May 26, 1953, 82 Commonwealth was acquired from the Grays by Maurice S. Green. It became the home of Mrs. Helen Cole, who operated it as a multiple dwelling, probably a lodging house, called Crestwood Mansion. She continued to live there until about 1959. On November 14, 1961, 82 Commonwealth was acquired by Nick Haddad, trustee of Cook Realty Trust. It appears likely that it was at about this time that a two-story addition was constructed, with fourteen apartments. On April 14, 1978, 82 Commonwealth was acquired from Nick Haddad by Andrius Keturakis and his wife, Veronica Keturakis. Andrius Keturakis died in April of 1982, and on September 2, 1983, Veronica Keturakis transferred the property to herself as trustee of the Keturakis Realty Trust. On March 30, 1987, she transferred the property to the Keturakis Realty Corporation. 82 Commonwealth remained apartments in 2015.